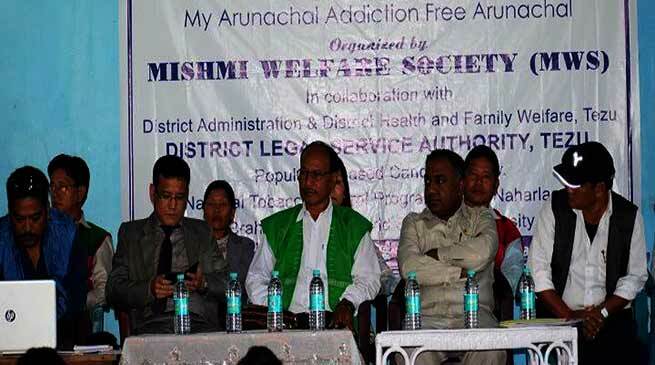 Mishmi Welfare Society (MWS) HQ-Itanagar in collaboration with Legal Services Lohit and Department of Health & Family Welfare Lohit organised an awareness campaign on Drugs/ Opium/ Tobacco on the theme “My Arunachal Addiction Free Arunachal” at the Auditorium of Indira Gandhi Government College, Tezu, on Sunday. Lohit District Deputy Commissioner Karma Leki, SP Isaac Pertin, District Sessions Judge I. Basar, HoDS, public leaders, students NGOs, senior citizens and other members of civil society organisations attended the awareness campaign. Deputy Commissioner Leki speaking on the occasion has assured to provide full support and cooperation from the District Administration to eradicate the menace of drugs specially opium in the District. He extended his praises to the Mishmi Welfare Society, Legal Services Lohit and, Department of Health and Family Welfare for their initiative to spread awareness on the ill effect of drug abuse and it’s implications on a civilised society and he stressed every corner of the society to strive together for building a drug free society. He also assured to pursue the proposal for Alternate Livelihood in the district. SP Pertin made an appeal to the public of the District to quit the practice of illegal opium cultivation. NDPS act 1985 has laid down that, opium cultivation on reserved forest as Illegal and stringent action can be taken against such cultivators. The resource person of the awareness camp Dr Sachin Parab Project Director of Global Initiative of Tobacco Awareness from Mumbai highlighted on the alarming state of drug abuse cases in India and Lohit district in particular. The growing menace can be addressed through proper approach and intervention with conduct of such awareness camps and set up of proper rehabilitation centres. Chairman of MWS Dr. Sopai Tawsik, Judge I. Basar, Dr. B. Natung National Tobacco Control Programme DDHS, Sunil Mow GS MWS, DMO Dr. Sajinglu Chai Pul also spoke on the occasion.